Celeriac isn’t the prettiest of vegetables but you should never judge a book by its cover as they say. Despite it looking like a close-up of an insect under a microscope (as someone described it recently over on my Facebook page), I tend to get very excited when I discover one in our weekly veg box. It’s wonderful simply boiled and mashed with a little butter, in a gratin with potatoes and lots of cream and garlic, or grated raw in an Ottolenghi-style root vegetable salad. I reckon it’s one of the most versatile vegetables around. But my personal favourite is to partner celeriac with some kind of blue cheese in a soup. The mellow earthy, nutty flavour works so well with the tang of a good blue cheese. 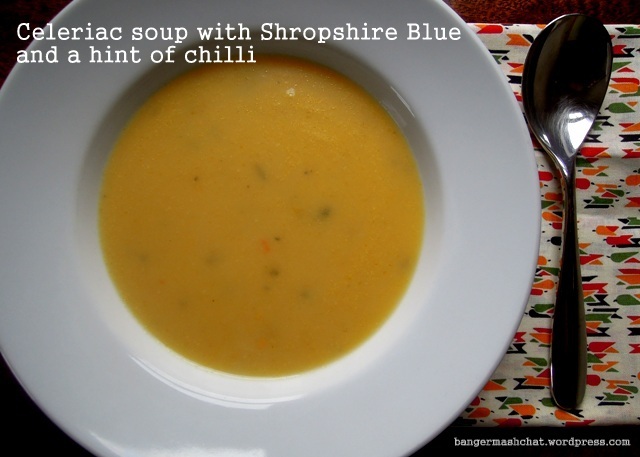 Stilton is always popular but I prefer a Shropshire Blue, which isn’t quite so in-your-face and gives the soup a wonderful orangey colour. For a little extra kick, I do rather like to add a little chilli too, although I generally leave this out when I’m making it for the children. But as I cooked this last week for just me and my husband, the chilli was most definitely in, helping to boost the central heating on a wet, chilly day. Heat the oil and butter in a large pan and gently sweat the onion until soft. Add the celeriac and cook a little, making sure the pieces get a good coating of butter and oil. Throw in the chopped chilli and fry for a couple more minutes before adding the hot stock. Allow to simmer for around 15 minutes until the celeriac is tender. Cool a little before liquidising to a smooth consistency. What a perfect soup for our still chill weather. Really like the look of this, especially with the warmth of the chilli too. Thanks Andrea. The touch of chilli is so perfect for these cold days and goes really well with both the celeriac and the blue cheese. I’ve spent many years looking at insects under microscopes, so I like the analogy- could it explain my love of celeriac? I would agree it is very versatile, and your lovely recipe makes it shine, Shropshire Blue is a very fine blue cheese. Thanks! That must be why you love celeriac – absolutely! It’s a great description isn’t it? A new soup recipe to try – and this one has an really interesting combination of flavours too, bound to be good! What a fabulously interesting soup recipe! Big fan of celeriac too, whenever I’m in the UK anyway. I don’t think it’s wonders have caught on in France but they’re seriously missing out. And Shropshire Blue happens to be one of my favourite cheeses ever. My Granny (who lived on the border of Shropshire!) always used to have it in and I can remember adoring it from a very wee age…and probably gave me my love for blue cheese! Tried this yesterday, and as celeriac is a new veggie for me (a California girl), I wasn’t sure how it would be. I used stilton as I had some on hand and added a carrot as my celeriac was a bit small. But even with the substitutions/additions, it really was so, so good! Thanks Bangers & Mash…great recipe. So glad you liked it Jenn. Celeriac rocks! What an interesting combo. Will have to try this! I’d be really interested to know what you think if you do!